Spring is finally here and with it comes the Jewish holiday of Passover. A quick search of the App Store brings up a nice list of apps for the holiday including stories and fun activities. Below are a few of our recommendations. Telling the Passover story is one of the most important mitzvoth of the holiday. There are many storybook apps out there relating the story of the exodus of the Israelites out of Egypt. 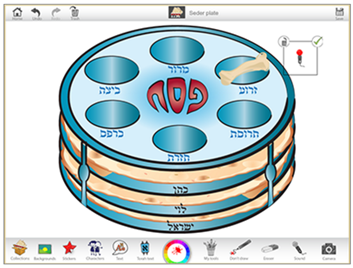 Some are available in Hebrew as well as English and most include interactive features and even some additional activities. Here are a few of our recommendations. The app is in English but there is an option to record in your own voice which can be helpful for those who speak other languages. It can also be a nice family activity of reading together, and the child can record the story in his own voice. The app also comes with coloring pages, puzzles, and a memory game, all related to the story’s theme. This app is a cute interactive storybook with cartoon drawings telling the story of the exodus from Egypt. It is available in English only, but is available on iOS, Google Play and Windows. It is worth checking out their website for other storybook apps. App Sameach is a company that creates holiday apps and activities. My Pesach is a storybook app that includes games and coloring activities as well. A series of cute animal characters figure in all their apps and in the wide range of holiday printables available on the website. Their apps are available in English, Hebrew, French, Italian, and Spanish. Reading the Haggada during the Seder, the ceremonial meal that takes place on the first two nights of the holiday, is one of the highlights of the evening. In anticipation of the holiday, Beit Issie Shapiro has prepared a simplified Haggada, in Hebrew, on the TinyTap platform, so that children of all abilities can participate in the ceremony. It also incorporates symbolstix, for users of AAC. There are many Haggada apps on the AppStore, both in English and in Hebrew. One beautiful one that we found has been created by the organization Yeladim: Fair Chance for Children. It incorporates art by Israeli artist, Hanoch Piven, that he produced together with children at risk that the organization services. It is available only in Hebrew but children will enjoy the whimsical images. You can find the link here. As a bonus we are also providing links to two other Passover games that Beit Issie Shapiro has created on TinyTap, also in Hebrew. You can search for the games in the Tiny Tap library, using the Hebrew words, or you can access them through the links provided. These last two activities were created by one of the teachers at the Beit Issie Shapiro Special Education School. In the first one, help Haggai find the Afikoman so he can get his surprise. In the second practice reading and writing Passover sentences, using symbols. For those of you with a membership to the Gingim website, there is a nice game practicing Passover words. The website is in Hebrew, as is the game. There are a few settings to choose from, including using the virtual or standard keyboard, and whether to provide visual or just auditory hints. Their website has a links to great holiday ideas using their JI Studio available for iOS and PC or MAC. You can make scenes from the story of the exodus from Egypt, or build your own seder plate. Pictures can then be saved and used in numerous other apps like Tiny Tap to create fun holiday activities. When looking for apps to review vocabulary or concepts related to a particular subject, Bitsboard and TinyTap are always great options. Both of these apps have extensive libraries of ready made educational games. A simple search will likely reveal a large choice of Passover-themed activities, both in English and Hebrew. Don’t forget about our tips to encourage Participation! Take screenshots of the various menus, then enlarge, print, and cut them out, as appropriate, to allow for easier choice making. If your child uses a communication device with voice output make sure to add appropriate phrases or even links to songs so they can participate in the voice recording options as well. For children that use switches, allow them to take family photos by turning on switch control in iPad settings. Use a mount or stand that keeps the camera lens clear to give the child even more independence if they can’t hold the iPad themselves.